I have loved puns for even longer than I have loved wine. 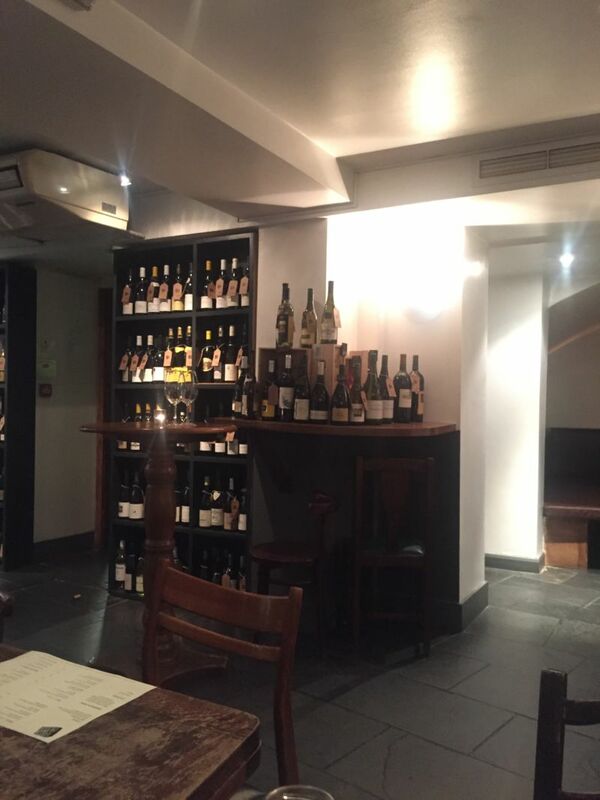 There was no way I could resist visiting a wine bar called “Planet of the Grapes”; especially as it was just across the road from the London office in which I was working for a few days. Picking a place because the name makes you giggle is probably not the best decision-making process, but this bar also came with a personal recommendation. The bar’s entrance is tucked down an alley just off Queen Victoria Street. You walk down stairs to an intimate space, with tables and shelves of wine. Unusually, for a wine bar they have no wine list. If you want a bottle, you need to look at the bottles on the shelves and talk with the staff. Each bottle has two prices; one you pay to drink in the bar, the other to take away. California Girl had headed to Eastern Europe by this point, so I was looking for a glass of wine; for which they do provide a list. They sell 175ml and 250ml pours. The smaller measure is still plenty generous. Since, I wanted to try more than one glass, I went for the smaller option. The list by the glass clearly changes, as the one from I which ordered differed from the one on their website. The price of the smaller glasses varied from £8 to £11. ($10 to $13.75) The stemware they use is large, making it easy to swirl the wine and inhale deeply. Planet of the Grapes has a food menu too; with a selection of small plates all of which are under £10 ($12.50). After breakfast and lunch they represented sufficient food. The bar also offers some larger meals. Again, the menu on their website differs from what I saw. I enjoyed the place so much on my first visit, that I went back the next night. This allowed me to try four different wines and two dishes. The first wine was Château La Croix Grézerd from Lussac St Emillion in France. The wine had a dark purple hue and a nose that combined plum, blackberry, and hints of earth. Once I sipped it, I found medium acidity, soft tannins, and a pleasing dryness that combined with subtle raspberry forward fruitiness. This was excellent; my favourite of the four wines that I drank here. 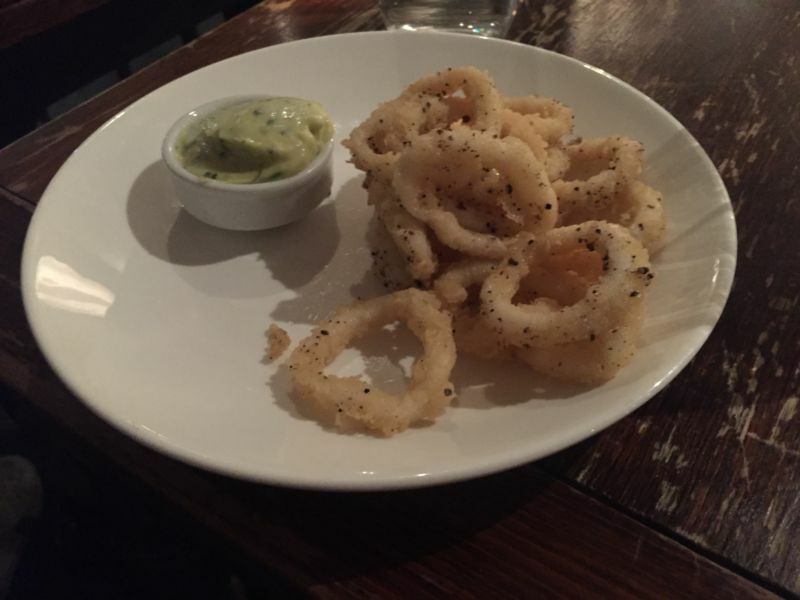 I ate the squid on the first night; battered very lightly and seasoned with lemon, salt, and pepper. It was served with garlic aioli. It would have been perfect, but for the slightly out of balance pepper. The wine held up to the spice of the food very well. The music was at a low-level, allowing people at nearby tables to talk at a normal conversational level. Planet of the Grapes gets bonus points for the choice of music, which included “Comfortably Numb” and “Freeboard”. 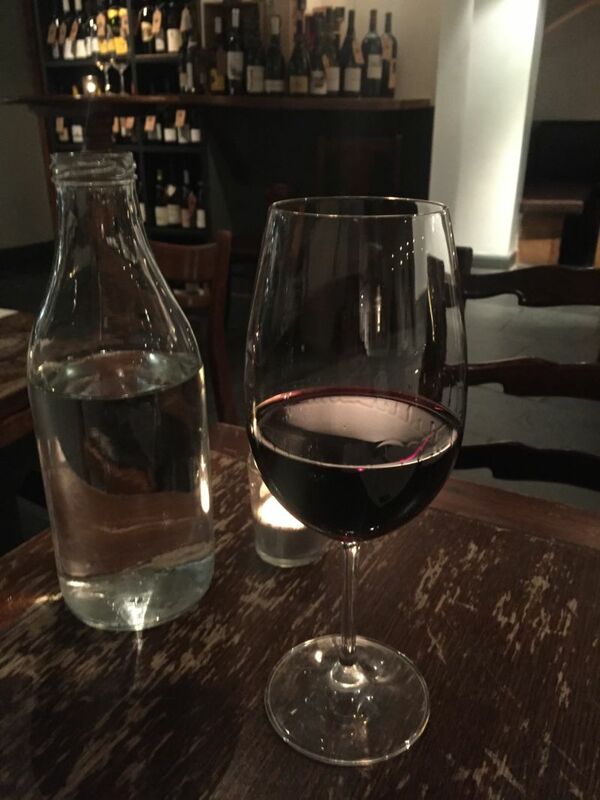 My post dinner glass was the 2013 Isolabella della Croce, Monferrato. The wine is a blend of Barbera, Nebbiolo, and Dolcetto. The result was a wine that gave me a nose of cloves and grilled steak. It offered medium plus acidity and was a bright, easy to drink wine. My initial impression was of moderate tannins, but there was a long, lingering mouth of pepper and berries that left one realizing the tannins were harsher than I first thought. The staff were friendly and attentive, without ever being pushy. On my second night, I started with a Rioja; the 2010 Ondarre Reserve. The nose was an overwhelming and delightfully rich nose of fruit, with cherry in the main role. Unfortunately, the flavour did not match that wonderful richness, although it was more than drinkable. There was medium acidity and moderate tannins. The bright flavour lingered well, but lacked the strong characters of that nose. 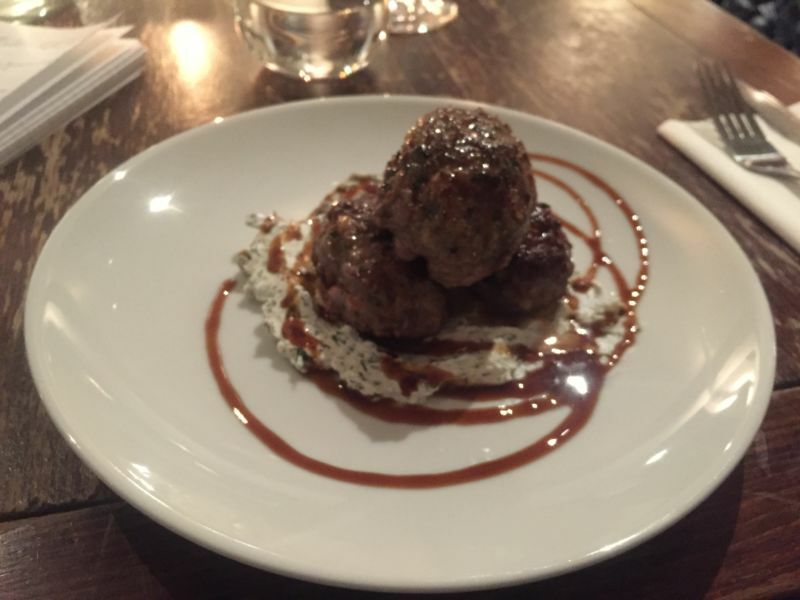 My dish for this second night was lamb kofta, herb labneh, and pomegranate mollases. Labneh is a Greek yoghurt based cheese; vaguely like cream-cheese. In this case, it had mint added. The acidity of the yoghurt was beautifully balanced by the sweetness of the mollases. The meat-balls were well spiced, made from coarsely ground lamb, and cooked to a beautiful shade of pink. Again a very tasty snack. On this second night at Planet of the Grapes, my after dinner drink was the 2015 Lora Malbec from Argentina. The nose was smoke, earth, and a hint of blackberry. Reversing the situation with the Rioja, this wine’s smell undersold it. There was a medium acidity, with pepper and rich fruits. None of these fruits were present on the nose. Then there was a perfectly balanced set of tannins that tingled the tongue on the end of each taste. Overall, the ambience, staff, food, and wine make this a place to seek out in London. They have a total of four locations. The one that I visited was the Bow Lane bar.